Having grown up reading Lucy Maud Montgomery’s books always makes me excited and wary whenever a screen adaptation of her work is on the television. After all, it’s not everyday that it happens. I won’t lie–I’ll always have high expectations. Take Anne of Green Gables, for example. No child who grew up in the eighties and nineties could ever forget Megan Follows’ portrayal of the lovable redheaded orphan. While Kevin Sullivan wasn’t exactly faithful to the plot (coughContinuingStorycough), it was a good adaptation. After all, it’s hard to jam in eight books into more or less two or three more series–or episodes, rather. I’ve yet to see Rilla of Ingleside adapted into a screenplay–something I’d hope to see in my lifetime. Back to Anne of Green Gables. Last year, Netflix released their take on the aforementioned book, but they titled it Anne with an E. I’ve already finished watching the second series/season, and I love it just as much as I loved the Kevin Sullivan production (well, except for Anne of Green Gables: The Continuing Story). .And yep, Netflix wasn’t faithful to the source material, either. I am however, giving five reasons why Anne with an E is still worth a watch. The characters, while some of them not entirely in keeping with the books, still managed to be well-rounded. And I loved the best friend dynamics between Anne and Diana. For some reason, the portrayal of their friendship was so authentic and you would just want to hug them both. Not that Megan Follows and Schuyler Grant didn’t do a good job–but Amybeth McNulty and Dalila Bela put a wonderful, sweet, homey spin to it. Oh, you know what I mean. The storyline doesn’t just focus on Anne Shirley, but on other characters too. Here, in the series, we get a glimpse of Diana Barry’s life, in Jane and Prissy Andrews’ life, in Gilbert Blythe’s life–you get the picture. The viewer gets a chance to know them more. The filming location is 100% lush. I have friends who rave about how much they love Canada, but man, I probably did not receive the memo about how BEAUTIFUL Canada is (in addition to being fabulous). Prince Edward Island is stunning. I can go on all evening. It’s a bit darker, but it fits perfectly. Initially, I wasn’t sold on the theme, but when I watched the first series another time, it grew on me. The series touched on topics such as bullying, racial prejudice, and peer pressure, matters that are terribly relevant today. This was grittily yet beautifully portrayed in the second series. The second to the last sentence does sound ironic, but it is true. Yes, Megan Follows was best known for playing the titular role. 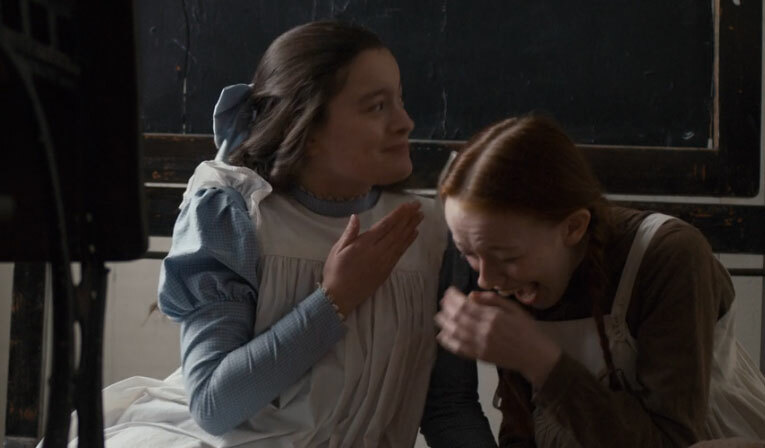 I’m going to risk getting a lot of hate–because Amybeth McNulty made a very engaging Anne, and I do think she deserves to tie with Megan in that top spot. The way she delivers her lines (majority of which weren’t in the source material)–there was so much emotion, that it felt like every time she opened her mouth, jewels and flowers fell out. Consider me a fan, stat. Next Post Events || An Invitation!